Glenn Allen Giles was born in Southern California in 1953. At the age of 13 he was handed an old worn out Bible and encouraged to read about the crucifixion of Jesus. The love of God touched his heart and Glenn decided to follow Jesus. Alone one night, he trusted Christ as Savior and promised to obey Him as Lord of his life. After graduating from high school in Seattle, he enlisted in the US Navy. He served in Washington, DC in security communications. Glenn was called into the gospel ministry in 1977 and was ordained in 1982. He is a graduate of George Mason University with a degree in social sciences. He graduated from Southeastern Baptist Theological Seminary with a Master of Divinity degree in 1984. Glenn is blessed to be married to Debbie Prevett Giles. She is his best friend and a partner in ministry. Between the two of them, they have 7 grown children and 8 grandchildren. They make their home in Botetourt County. 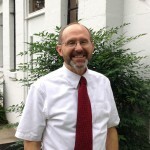 Glenn has served 5 Southern Baptist churches as pastor and one mission. He has over 30 years of pastoral experience. His international travel includes a Study Tour of Israel and a Mission Trip to Mexico City. In his leisure time, Glenn likes to read, hike, run, fish, sail, and do woodworking. He loves the Lord and he loves people. Enon called Glenn to serve as our Pastor in July of 2009.